Sometimes I love you, but sometimes……..I don’t understand you. Let me explain this. The above pictures are some of our Hollywood friends involved in a campaign called #BringBackOurGirls and Real Men don’t Buy Girls. Now, let me start by saying something off the start. 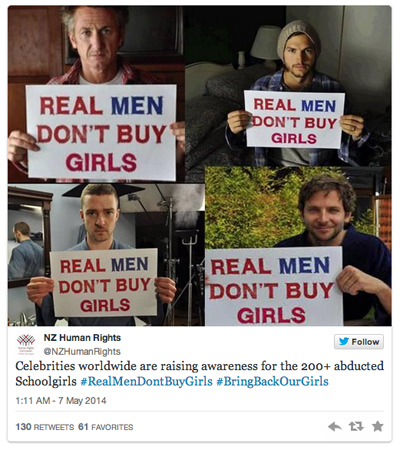 Of course, I agree that Real Men don’t Buy Girls. I also don’t think ANYONE should be kidnapping girls. But, I also know issues like human trafficking and sexual explotation are not solved trendy hashtags and flashy social media campaigns with cool celebrities. Because while we have been Facebooking, Tweeting, and Instagramming, human trafficking has been happening around you. Want proof? Sure! Here’s a story you haven’t been following. It’s a story in Canada. It’s a story of over 1,000 aboriginal women that have been murdered. This is between 1980 to 2012. Below is the story for you to read. Why aren’t you looking? Is it because there is no social media campaign? Do they need a hashtag or a hunky celebrity? Want more stats? Sure! Or, maybe a report for you to read if you want. You can see that these issues are serious. And you probably realize that this issue is a world wide issue. Which leads us to the topic of a man named Boko Haram. Who are they? They have been around since 2002. They operate in Nigeria, Cameroon and Chad. They are obviously tough, ruthless and evil. So, seriously, do you actually think this group is intimidated by trendy celebrities with signs? No! Want more? Here is something from Kathleen Smith that she posted on her Facebook. Nigeria doesn’t want the Americans there. They have been loud and clear on that. The hashtag was a statement on the part of mothers of those girls, and was never meant to be co-opted by an American government that will invade and takeover the country to ensure their economic interests. Don’t be fooled again, folks. My point? Do your research! There are people with knowledge and education that knows what is going on. What will work,what will not work. As well as the impact of both. Because this topic needs a real conversation and education. Not trendy hashtags, cool celebrities, and people feeling cool that they are involved. Agree or Disagree: The Podcast-Discussion on Human Trafficking. This morning, Carmin Moore from ACT Alberta (Action Coalition on Human Trafficking) and I discuss a talk that is going on this weekend. Kathryn Bolkovic, from whom the movie The Whistleblower is based on, will be at The Lantern Church on Saturday April 12 to discuss Human Trafficking in Calgary and Beyond. Topics we cover in the interview include. Media influence sensationalizing the issue. Volunteering opportunities and how one can get involved. The Social Media conversation and how it can be healthier around this issue. Below, you can read my column that I posted in the Calgary Beacon about the post. I thought I would add this video from Carmin Moore from the Children’s Cottage. This video was done for promotion for the show we discussed yesterday called Invisible.